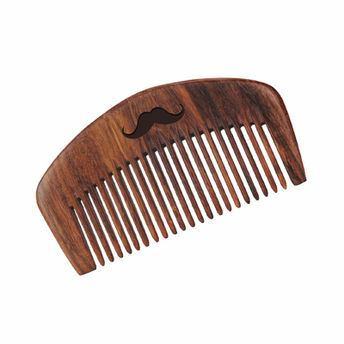 This majestic Sheesham Wood comb has been hand-carved in a beautiful design. It's a perfect grooming comb for a sensitive scalp or skin and it comes with well known benefits. It prevents from scraping your scalp and protects your beard from dying by distributing oil from your scalp to hair. It has a property to not conduct electricity which will prevent hair damage from static unlike plastic combs which produce static energy and snap the hair. Additional Information: Men Deserve have researched and developed ultra premium products that help keep the beard and hair healthy, shiny and ready to show off to the world. But beyond just giving customers the products that they feel are beneficial to their aesthetic improvement, Men Deserve is proud to say that they are meticulous about the ingredients they use. Explore the entire range of Hair Combs available on Nykaa. Shop more MEN DESERVE products here.You can browse through the complete world of MEN DESERVE Hair Combs .